The US President, John F Kennedy, made a ground-breaking speech in Berlin offering American solidarity to the citizens of West Germany. A crowd of 120,000 Berliners gathered in front of the Schöneberg Rathaus (City Hall) to hear President Kennedy speak. They began gathering in the square long before he was due to arrive, and when he finally appeared on the podium they gave him an ovation of several minutes. The president had just returned from a visit on foot to one of the Berlin Wall's most notorious crossing points, Checkpoint Charlie. 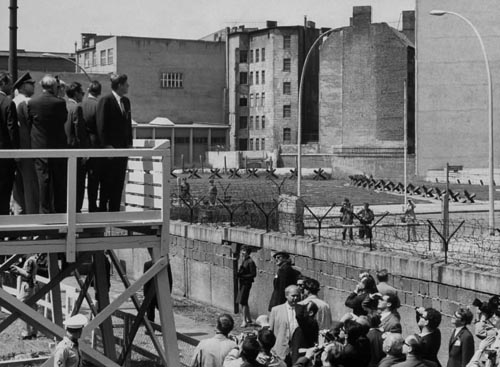 He was watched from the other side of the border by small groups of East Berliners unable even to wave because of the presence of large groups of the East German People's Police. "Two thousand years ago," he told the crowd, "the proudest boast in the world was 'civis Romanus sum'. "Today, in the world of freedom, the proudest boast is 'Ich bin ein Berliner.'" "Freedom has many difficulties and democracy is not perfect," he continued. "But we never had to put up a wall to keep our people in." His speech was punctuated throughout by rapturous cheers of approval. "All free men, wherever they may live, are citizens of Berlin, and therefore, as a free man, I take pride in the words, 'Ich bin ein Berliner.'" After the speech, the mayor of West Berlin, Willi Brandt, spoke out for the citizens of East Germany, saying they would be brought out in a few days to greet the Soviet leader, Nikita Khrushchev, whether they wanted to or not. "But they would much rather be with us, freely gathered here," he said. "We tell them, we will not give up. Berlin is true to those behind barbed wire as to fellow countrymen in the West and friends in the whole world." His words were followed by the tolling of the Freedom Bell from the belfry of the Rathaus in remembrance of those in East Germany. For the first time that day, the massive crowd fell silent.